A new client to TMB Events approached us to help with their Showrooms of Excellence event to be held in September 2014. We sourced some venue options for the client and they settled on The Belfry near Sutton Coldfield. TMB Entertainment liaised with The Belfry on accommodation, golf, cocktail making, meeting space and all elements of the dinner including a 3 course menu plus canapés, drinks reception and drinks during dinner. In addition to this, we created a Moulin Rouge themed room for dinner which consisted of black and red drapes over the whole room, a red stage set and themed props. Golf kicked off the day with a 9am start for players. Once they were all out on the golf course, other guests started to arrive to try their hand at cocktail making accompanied by a sumptuous lunch. New products of our client were set up in the foyer of the main room and a presentation took place at 5.30pm followed by a product viewing for guests. During the drinks reception, guests were entertained by a Silhouette Artist and Magician who also performed around the tables when they went through to dinner. 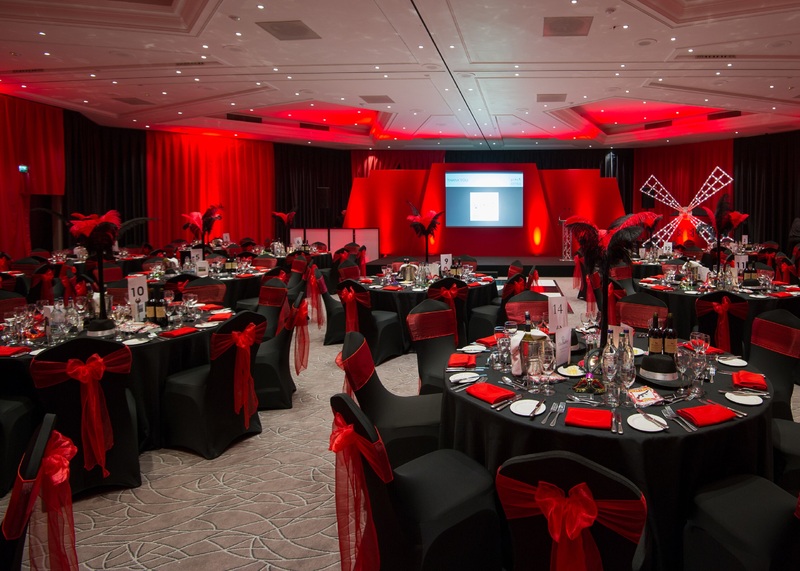 The room was turned around after the presentation for dinner, a dance floor laid, tables set with black and red linen and Moulin Rouge themed place name cards and novelty giveaways which included hats, masks and inflatable guns, were put around the tables. After the main course, prizes were awarded to some of those who played golf including “nearest to the pin” and “longest drive”. After dessert, some Dancers entertained guests with a Moulin Rouge dance followed by the Can Can! Casino tables were set up in the foyer area whilst guests were having dinner and opened after the dancers performance – these proved to be a huge hit with the guests and one lucky guest was awarded a brand new Ipad Air as the winner with the most money at the end of the night. The evening ended with guests throwing shapes on the dancefloor to our DJ before retiring to their bedrooms.